An assassination may be prompted by religious, political or military motives. It is an act that may be done for financial gain, to avenge a grievance, from a desire to acquire fame or notoriety, or because of a military, security, insurgent or secret police group's command to carry out the homicide. Acts of assassination have been performed since ancient times. 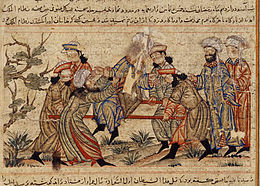 The word assassin is often believed to derive from the word Hashshashin (Arabic: حشّاشين, ħashshāshīyīn, also Hashishin, Hashashiyyin, or Assassins), and shares its etymological roots with hashish (/hæˈʃiːʃ/ or /ˈhæʃiːʃ/; from Arabic: حشيش ḥashīsh). It referred to a group of Nizari Shia Muslims who worked against various political targets. Founded by Hassan-i Sabbah, the Assassins were active in the fortress of Alamut in Persia from the 8th to the 14th centuries, and later expanded by capturing forts in Syria. The group killed members of the Abbasid, Seljuq, Fatimid, and Christian Crusader elite for political and religious reasons. Although it is commonly believed that Assassins were under the influence of hashish during their killings or during their indoctrination, there is debate as to whether these claims have merit, with many Eastern writers and an increasing number of Western academics coming to believe that drug-taking was not the key feature behind the name. The earliest known use of the verb "to assassinate" in printed English was by Matthew Sutcliffe in A Briefe Replie to a Certaine Odious and Slanderous Libel, Lately Published by a Seditious Jesuite, a pamphlet printed in 1600, five years before it was used in Macbeth by William Shakespeare (1605). In the Old Testament, King Joash of Judah was recorded as being assassinated by his own servants; Joab assassinated Absalom, King David's son; and King Sennacherib of Assyria was assassinated by his own sons. Chanakya (c. 350–283 BC) wrote about assassinations in detail in his political treatise Arthashastra. His student Chandragupta Maurya, the founder of the Maurya Empire, later made use of assassinations against some of his enemies, including two of Alexander the Great's generals, Nicanor and Philip. Other famous victims are Philip II of Macedon (336 BC), the father of Alexander the Great, and Roman consul Julius Caesar (44 BC). Emperors of Rome often met their end in this way, as did many of the Muslim Shia Imams hundreds of years later. 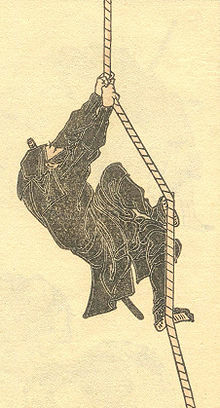 The practice was also well known in ancient China, as in Jing Ke's failed assassination of Qin king Ying Zheng in 227 BC. 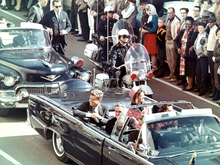 Whilst many assassinations were performed by individuals or small groups, there were also specialized units who used a collective group of people to perform more than one assassination. The earliest were the sicarii in 6 A.D., who predated the Middle Eastern assassins and Japanese ninjas by centuries. Assassination of William the Silent of Holland. In the modern world, the killing of important people began to become more than a tool in power struggles between rulers themselves and was also used for political symbolism, such as in the propaganda of the deed. In Russia alone, two emperors, Paul I and his grandson Alexander II, were assassinated within 80 years. In the United Kingdom, only one Prime Minister has been assassinated—Spencer Perceval on May 11, 1812. In Japan, a group of assassins called the Four Hitokiri of the Bakumatsu killed a number of people, including Ii Naosuke who was the head of administration for the Tokugawa shogunate, during the Boshin War. Most of the assassinations in Japan were committed with bladed weaponry, a trait that was carried on into modern history. A video-record exists of the assassination of Inejiro Asanuma, using a sword. 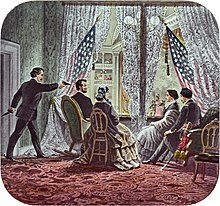 In the United States, within 100 years, four presidents—Abraham Lincoln, James A. Garfield, William McKinley and John F. Kennedy—died at the hands of assassins. There have been at least 20 known attempts on U.S. presidents' lives. Huey Long, a Senator, was assassinated on September 10, 1935. Robert F. Kennedy, a Senator and a presidential candidate, was also assassinated on June 6, 1968 in the United States. In Austria, the assassination of Archduke Franz Ferdinand and his wife Sophie, Duchess of Hohenberg in Sarajevo on June 28, 1914, carried out by Gavrilo Princip, a Serbian national and a member of the Serbian nationalist insurgents (The Black Hand), is blamed for igniting World War I after a succession of minor conflicts, while belligerents on both sides in World War II used operatives specifically trained for assassination. Reinhard Heydrich died after an attack by British-trained Czechoslovak soldiers on behalf of the Czechoslovak government in exile in Operation Anthropoid, and knowledge from decoded transmissions allowed the United States to carry out a targeted attack, killing Japanese Admiral Isoroku Yamamoto while he was travelling by plane. The Polish Home Army conducted a regular campaign of assassinations against top Nazi German officials in occupied Poland. Adolf Hitler was almost killed by his own officers, and survived various attempts by other persons and organizations (such as Operation Foxley, though this plan was never put into practice). During the 1930s and 1940s, Joseph Stalin's NKVD carried out numerous assassinations outside of the Soviet Union, such as the killings of Organization of Ukrainian Nationalists leader Yevhen Konovalets, Ignace Poretsky, Fourth International secretary Rudolf Klement, Leon Trotsky, and the Workers' Party of Marxist Unification (POUM) leadership in Catalonia. India's "Father of the Nation", Mahatma Gandhi, was shot to death on January 30, 1948 by Nathuram Godse. The African-American civil rights activist, Martin Luther King Jr., was assassinated on April 4, 1968, at the Lorraine Motel (now the National Civil Rights Museum) in Memphis, Tennessee. Three years prior, another African-American civil rights activist, Malcolm X, was assassinated at the Audubon Ballroom on February 21, 1965. Two years prior, another African-American civil rights activist, Medgar Evers, was assassinated on June 12, 1963. Fred Hampton of the Black Panther Party was assassinated on December 4, 1969. Orlando Letelier, a former Chilean minister, was assassinated in Washington, D.C. in 1976. Letelier's murder was part of the U.S.-backed state terror campaign known as Operation Condor. Anwar Sadat, President of the Arab Republic of Egypt (formerly President of the United Arab Republic), was assassinated October 6, 1981, during the annual parade celebrating Operation Badr, the opening maneuver of the Yom Kippur War. Swedish prime minister Olof Palme was murdered by a gun-wielding man close to midnight on February 28, 1986, after having visited a cinema with his wife. The couple were not accompanied by a body guard detail. The identity of the assassin and the reason for the murder are still unknown. On August 17, 1988, President of Pakistan Gen. M. Zia ul Haq died alongside 31 others including the Chief of Staff of the Pakistani Armed Forces, the US Ambassador to Pakistan and the chief of the US Military Mission to Pakistan when his C-130 transport plane mysteriously crashed. The crash is widely considered – in Pakistan – to be an act of political assassination. In India, Prime Ministers Indira Gandhi and her son Rajiv Gandhi (neither of whom were related to Mahatma Gandhi, who was assassinated in 1948), were assassinated in 1984 and 1991 respectively. The assassinations were linked to separatist movements in Punjab and northern Sri Lanka, respectively. In Pakistan, former prime minister and opposition leader Benazir Bhutto was assassinated in 2007, while running for re-election. Bhutto's assassination drew unanimous condemnation from the international community. Assassination for military purposes has long been espoused – Sun Tzu, writing around 500 BC, argued in favor of using assassination in his book The Art of War. Nearly 2000 years later, in his book The Prince, Machiavelli also advises rulers to assassinate enemies whenever possible so they won't pose a threat. An army and even a nation might be based upon and around a particularly strong, canny, or charismatic leader, whose loss could paralyze the ability of both to make war. For similar and additional reasons, assassination has also sometimes been used in the conduct of foreign policy. The costs and benefits of such actions are difficult to compute, especially when they depend upon the policies of a successor, and one study has found that perceptual biases held by leaders often negatively affect decision making in this area, such that decisions made to go forward with assassinations often reflect the vague hope that any successor might be better. The assassination of Reinhard Heydrich in Prague on May 27, 1942 by the British and Czechoslovak government-in-exile. This case illustrates the difficulty of comparing the benefits of a foreign policy goal (strengthening the legitimacy and influence of the Czechoslovak government-in-exile in London) against the possible costs resulting from an assassination (the Lidice massacre). This tactic was used again by the Provisional IRA during the Troubles in Northern Ireland (1969–1998). Killing of RUC officers and assassination of Unionist politicians was one of a number of methods used in the Provisional IRA campaign 1969–1997. The IRA also attempted to assassinate British Prime Minister Margaret Thatcher by bombing the Conservative Party Conference in a Brighton hotel. Loyalist paramilitaries retaliated by killing Catholics at random and assassinating Irish nationalist politicians. Basque terrorists ETA in Spain have assassinated many security and political figures since the late 1960s, notably the President of the Government of Spain Luis Carrero Blanco, 1st Duke of Carrero-Blanco Grandee of Spain, in 1973. Since the early 1990s, they have also targeted academics, journalists and local politicians who publicly disagreed with them. A sniper with a precision rifle is often used in fictional assassinations. However, certain pragmatic difficulties attend long-range shooting, including finding a hidden shooting position with a clear line-of-sight, detailed advance knowledge of the intended victim's travel plans, the ability to identify the target at long range, and the ability to score a first-round lethal hit at long range, usually measured in hundreds of meters. A dedicated sniper rifle is also expensive, often costing thousands of dollars because of the high level of precision machining and hand-finishing required to achieve extreme accuracy. In the case of state-sponsored assassination, poisoning can be more easily denied. Georgi Markov, a Bulgarian dissident was assassinated by ricin poisoning. A tiny pellet containing the poison was injected into his leg through a specially designed umbrella. Widespread allegations involving the Bulgarian government and KGB have not led to any legal results. However, after the fall of the USSR, it was learned that the KGB had developed an umbrella that could inject ricin pellets into a victim, and two former KGB agents who defected said the agency assisted in the murder. The CIA made several attempts to assassinate Fidel Castro, many of the schemes involving poisoning his cigars. In the late 1950s, KGB assassin Bohdan Stashynsky killed Ukrainian nationalist leaders Lev Rebet and Stepan Bandera with a spray gun that fired a jet of poison gas from a crushed cyanide ampule, making their deaths look like heart attacks. A 2006 case in the UK concerned the assassination of Alexander Litvinenko who was given a lethal dose of radioactive polonium-210, possibly passed to him in aerosol form sprayed directly onto his food. Litvinenko, a former KGB agent, had been granted asylum in the UK in 2000 after citing persecution in Russia. Shortly before his death he issued a statement accusing President of Russia Vladimir Putin of involvement in his assassination. President Putin denies he had any part in Litvinenko's death. Targeted killing is the intentional killing–by a government or its agents–of a civilian or "unlawful combatant" who is not in the government's custody. The target is a person asserted to be taking part in an armed conflict or terrorism, whether by bearing arms or otherwise, who has thereby lost the immunity from being targeted that he would otherwise have under the Third Geneva Convention. Note that this is a different term and concept from that of "targeted violence" as used by specialists who study violence. On the other hand, the American Civil Liberties Union also states on its website, "A program of targeted killing far from any battlefield, without charge or trial, violates the constitutional guarantee of due process. It also violates international law, under which lethal force may be used outside armed conflict zones only as a last resort to prevent imminent threats, when non-lethal means are not available. Targeting people who are suspected of terrorism for execution, far from any war zone, turns the whole world into a battlefield." Yael Stein, the research director of B'Tselem, The Israeli Information Center for Human Rights in the Occupied Territories, also states in her article "By Any Name Illegal and Immoral: Response to 'Israel's Policy of Targeted Killing'"
"The argument that this policy affords the public a sense of revenge and retribution could serve to justify acts both illegal and immoral. Clearly, lawbreakers ought to be punished. Yet, no matter how horrific their deeds, as the targeting of Israeli civilians indeed is, they should be punished according to the law. David's arguments could, in principle, justify the abolition of formal legal systems altogether". United Nations (UN) investigator Ben Emmerson said that U.S. drone strikes may have violated international humanitarian law. The Intercept reported, "Between January 2012 and February 2013, U.S. special operations airstrikes [in northeastern Afghanistan] killed more than 200 people. Of those, only 35 were the intended targets." 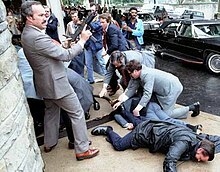 Most modern assassinations have been committed either during a public performance or during transport, both because of weaker security and security lapses, such as with U.S. President John F. Kennedy and former Pakistani Prime Minister Benazir Bhutto, or as part of coups d'état where security is either overwhelmed or completely removed, such as with Congolese Prime Minister Patrice Lumumba. Other potential targets go into seclusion, and are rarely heard from or seen in public, such as writer Salman Rushdie. A related form of protection is the use of body doubles, people with similar builds to those they are expected to impersonate. These persons are then made up, and in some cases altered to look like the target, with the body double then taking the place of the person in high risk situations. According to Joe R. Reeder, Under Secretary of the Army from 1993 to 1997, Fidel Castro used body doubles. ^ Black's Law Dictionary "the act of deliberately killing someone especially a public figure, usually for hire or for political reasons" (Legal Research, Analysis and Writing by William H. Putman p. 215 and Assassination Policy Under International Law Archived December 6, 2010, at the Wayback Machine, Harvard International Review, May 6, 2006 by Kristen Eichensehr). ^ "assassinate, v." OED Online. Oxford University Press, June 2016. Web. August 11, 2016. ^ Boesche, Roger (January 2003). "Kautilya's Arthaśāstra on War and Diplomacy in Ancient India" (PDF). The Journal of Military History. 67 (1): 9–37. doi:10.1353/jmh.2003.0006. ^ "FFZG.hr" (PDF). Retrieved December 29, 2013. ^ M. Gillen 1972 Assassination of the Prime Minister: the shocking death of Spencer Perceval. London: Sidgwick & Jackson ISBN 0-283-97881-3. ^ Chun, Jayson Makoto (2006). A Nation of a Hundred Million Idiots? : A Social History of Japanese Television, 1953–1973. Routledge. pp. 184–185. ISBN 978-0-415-97660-2. Retrieved March 22, 2014. ^ Church Committee – Interim Report: Alleged Assassination Plots Involving Foreign Leaders Part III.B, page 71 from the 'history-matters.com' website. Retrieved August 22, 2008. ^ "English front cover – No Safe Haven" (PDF). p. 100. Archived from the original (PDF) on September 2, 2010. Retrieved June 2, 2010. ^ "Mykonos front cover" (PDF). Archived from the original (PDF) on September 2, 2010. Retrieved May 13, 2010. ^ "Condemned by Law – Report 11-10-08.doc" (PDF). Archived from the original (PDF) on March 7, 2010. Retrieved May 13, 2010. ^ McSherry, J. Patrice (2011). "Chapter 5: "Industrial repression" and Operation Condor in Latin America". In Esparza, Marcia; Henry R. Huttenbach; Daniel Feierstein (eds.). State Violence and Genocide in Latin America: The Cold War Years (Critical Terrorism Studies). Routledge. p. 107. ISBN 0415664578. ^ a b Schilling, Warner R.; Schilling, Jonathan L. (Fall 2016). "Decision Making in Using Assassinations in International Relations". Political Science Quarterly. 131 (3): 503–539. ^ a b Abraham D. Sofaer (March 26, 2004). "Responses to Terrorism / Targeted killing is a necessary option". The San Francisco Chronicle. Archived from the original on August 29, 2011. Retrieved May 20, 2010. ^ Steven R. David (September 2002). "Fatal Choices: Israel's Policy Of Targeted Killing" (PDF). The Begin-Sadat Center for Strategic Studies. Archived from the original (PDF) on November 16, 2010. Retrieved May 29, 2010. ^ "Frequently Asked Questions About Targeting Killing | American Civil Liberties Union". Aclu.org. August 30, 2010. Retrieved August 13, 2012. ^ Stein, Yael (2003). "By Any Name Illegal and Immoral: Response to "Israel's Policy of Targeted Killing"". Carnegie Council. Retrieved January 31, 2019. ^ Dana Priest (November 8, 2002). "U.S. Citizen Among Those Killed In Yemen Predator Missile Strike". The Tech (MIT); The Washington Post. Retrieved May 19, 2010. ^ Drone strikes by US may violate international law, says UN . The Guardian. 18 October 2013. ^ UN report calls for independent investigations of drone attacks. The Guardian. 18 October 2013. ^ "The Assassination Complex". The Intercept. 15 October 2015. ^ Donaldson-Evans, Catherine (December 20, 2001). "It's Bin Laden ... or Is It?". Fox News. Archived from the original on August 5, 2012. Retrieved December 8, 2006. Clarke, James W. (2006). Defining Danger: American Assassins and the New Domestic Terrorists. Clarke, James W. (January 28, 2011). America's History of Crazy Political Assassins Didn't Begin with Loughner. History News Network'. Porter, Lindsay (2010). Assassination: a History of Political Murder. Thames and Hudson. Review The Daily Telegraph, April 3, 2010. "Section B. Killing, injuring or capturing an adversary by resort to perfidy". Customary IHL: Practice Relating to Rule 65. Perfidy. ICRC. "Hague Conventions of 1899 and 1907 (23.b.)". Yale University. This page was last edited on 16 April 2019, at 01:54 (UTC).